New Brunswick, N.J. – While cancer treatment advances are being made in the areas of precision medicine and immunotherapy, a unique combination of traditional therapies can also provide some cancer patients a treatment option that may provide significant benefit. For instance a lesser-known treatment combining cytoreductive surgery (CRS) and hyperthermic intraperitoneal chemotherapy (HIPEC) is being increasingly used to treat cancers that have spread to the abdominal cavity – a condition known as peritoneal metastases. This treatment strategy involves the surgical removal of metastatic cancer deposits followed by heated chemotherapy given within the abdominal cavity designed to obliterate the remaining invisible cancer cells that may be present in the tissues. Rutgers Cancer Institute of New Jersey is one of the few centers in the region whose surgeons have vast expertise in managing patients’ disease through this unique treatment. 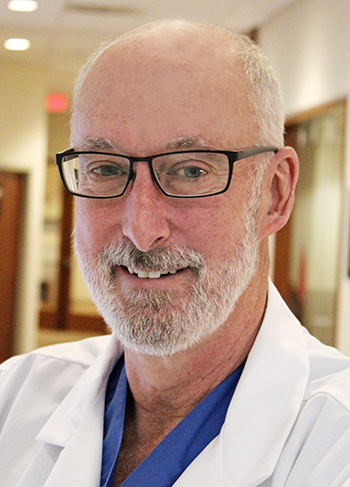 Having recently expanded its surgical and research focus on cancers of the abdominal cavity, the Institute has named H. Richard Alexander, MD, FACS, as its new chief surgical officer. Dr. Alexander, who is also a professor of surgery at Rutgers Robert Wood Johnson Medical School, has been pioneering the development of CRS-HIPEC through its evolution over the past two decades. He shares more about the procedure. Q: Tell us more about CRS-HIPEC. A: CRS and HIPEC are really two complementary components of treatment. CRS is the systematic removal of all visible cancer deposits in the abdominal cavity, but it is ineffective at addressing invisible or microscopic tumor deposits that are present in the abdominal tissues. HIPEC is a strategy of delivering an intensive dose of chemotherapy right to the tissues that are at risk of harboring invisible cancer cells. HIPEC is administered in the operating room right after the CRS is completed. It usually takes about 90 minutes and may be an optimal way of ensuring that the chemotherapy is distributed to all the tissues in the abdomen. It also takes advantage of the fact that many chemotherapy agents have an enhanced effect on killing cancer cells under hyperthermic conditions -- when the temperature in the tissues is slightly increased. Q: What kind of cancers can it treat? A: The CRS and HIPEC combination has been used to treat patients with a variety of cancers that have the ability to spread diffusely throughout the abdominal cavity such as colorectal cancer, appendiceal cancer, ovarian cancer, mesothelioma, and in some cases gastric or other cancers. There is growing evidence to support the use of CRS and HIPEC for some conditions. However, its use in some settings is more controversial. A: A surgical oncologist with expertise in CRS and HIPEC is the best person to discuss whether or not this treatment is an option for someone who has abdominal spread of cancer. The decision to proceed with the procedure should be a collaborative one involving the patient, the family, and all the cancer specialists involved. Ideally, it should be considered part of a thoughtful strategy that may include additional treatment before and after the procedure to assist in controlling the cancer. A patient should be in fundamentally good medical condition and not have other medical problems that might make the procedure unacceptably risky. Sometimes, additional testing may be necessary prior to the procedure. Q: Why is this procedure not widely offered at all hospitals or cancer treatment centers? A: CRS-HIPEC requires specialized expertise and equipment not available at all treatment centers. It is widely acknowledged that complications and the risk of the procedure are minimized when performed by surgeons and at medical centers with experience in this area, such as Rutgers Cancer Institute of New Jersey. Q: What is the benefit of receiving CRS-HIPEC at a National Cancer Institute-designated Comprehensive Cancer Center like Rutgers Cancer Institute? A: The reality is that patients who undergo the CRS-HIPEC procedure, even when it is considered successful, are at a higher risk of experiencing a recurrence at some point during follow-up surveillance. Because of that it is beneficial for a patient to be cared for at a facility where second-line treatment options and access to clinical trials are available. To learn more, visit: http://cinj.org/patient-care/adult/gastrointestinal and http://cinj.org/patient-care/surgical-oncology.